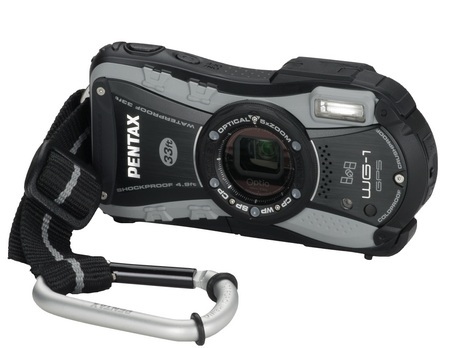 Pentax announced two new adventure series digital cameras, the Optio WG-1 and the Optio WG-1 GPS that are waterproof, dustproof, shockproog, coldproof and crushproof, “taking adventure photography to new heights”. Two cameras are nearly identical, with the WG-1 GPS comes with GPS functionality to track and record positional data recording with images making it easy for users to check the shooting locations of captured images. These WG-1 cameras feature 14 Megapixel image sensor, a 28mm wide angle 5x optical zoom lens,, Face Detection and an Enhanced Digital Microscope mode using the five macro LEDs for excellent macro lighting plus a detachable macro stand for steadier capture. 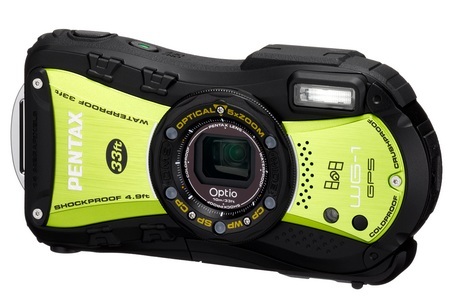 The new Optio supports 720p HD video recording at 30fps. 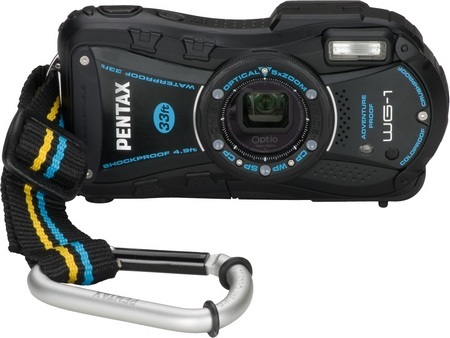 It comes with a woven web fabric strap with a carabiner to attach the camera to a backpack and other outdoor gear, and supports Eye-Fi wireless SD cards and HDMI output. The WG-1 and WG-1 GPS are coldproof to sub-freezing temps of minus 10 degrees C (14 degrees F); dustproof protection for dry, dusty environments; waterproof to 33 feet; shockproof to withstand falls up to 5 feet; and crushproof to withstand weight force up to 220 pounds. 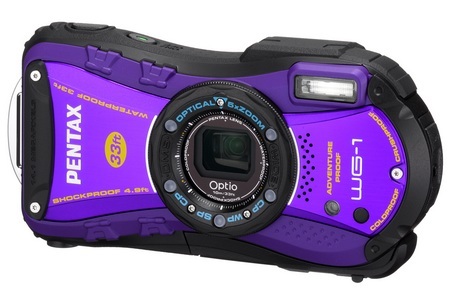 The Pentax Optio WG-1 will be available in black or purple for $349.95 while the WG-1 GPS comes in black and yellow for $399.95. They will be shipped in April. Do you know exactly when and where this will be available? I want! Thanks.